Papercrafts by Patti: Happy New Year! Happy New Year! And it's time to get stamping again. I took some time off after almost getting buried by making tags for gifts last-minute style!! My stamping studio is very messy, so creating is not easy. I WILL get it organized soon! I have a lot of friends who have a birthday this month, so I had to get some birthday cards done and mailed. Here is one of my first. I love the colors in this card. 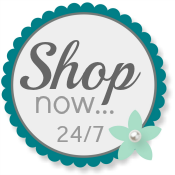 If you are in need of any Stampin' Up! supplies for your projects, please use my Website to order. Love how you stamped in white! Great color combination...so classy! Patti -- what a cheery card to start the new year with! I will definitely put it in my "look at this later" file! Happy New Year. Great card. Love how you did the Bitty Buttons! Love that bright red - my favorite color! The buttons are so cute! Hi Patti this is one fabby birthday creation, miss seeing your posts over the holiday..I was breaking a bit from blogging!!! Happy New Year sweetie, hope 2011 brings you much happiness!!! Hugs!